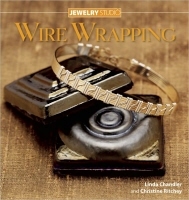 Compiled with advanced beginners and intermediate designers in mind, Wire Wrapping starts with the basics and builds skills progressively through each project. The easy-to-follow instructions emphasize safety first and list all the steps required to get started, with a detailed discussion given to using tools such as pliers and wire cutters—wire wrapping does not require a soldering torch—and selecting appropriate materials such as copper, brass, and sterling silver. Finishing these stunning projects are a snap with the tips, tricks, and techniques demonstrated.